Vivekananda Kendra Kanyakumari, Howrah Branch organised a 3 Days NRPDC on 8th to 10th April for the children of std 5th_10th at Arihant Enclave, Howrah. Overall 48 participants attended the Camp. The programme was concluded by Shri Rajesh Kohli, President of the Society. 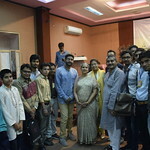 The Parents of the participants along with some other Committee Members were also present in the Concluding Session. The 2 Groups of participants performed a Play on Swamiji's life incident and the other group performed Suryanamaskar which they learned within three days of the Camp. Another Group performed a beautiful Action Song. 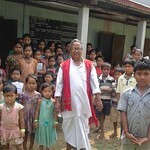 The whole Camp was conducted by shri Umapad Mondal_sayonjak, Howrah karya sthan, Ku. Shubhangi Upadhyay, samskar Varg pramukh and Shri Pradeep Jayswal, Prant Vyavastha Pramukh. The Committee of the Society has decided to continue such activities every week. So they have approached the Karyakartas of Vivekananda Kendra to start "weekly Yoga Varga" for everyone as well as "Sanskar Varga" for the children of the Society. Vivekananda Kendra Kanyakumari, Branch Nagpur had organised a parent workshop for the young parents of the students of Nursery, K.G.I,and K.G.II of "School of Scholars" on Saturday, the 2nd of April, 2016. The second session began with Action song and games conducted by Sou. 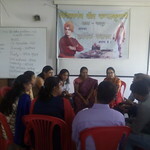 Monika Khare and Sou Nilima Ketkar followed by group discussion conducted by Sou. Archana Lapalkar. The young parents actively participated in the group discussion and enthusiastically presented their views through small skits. The summing up of the workshop was done by Sushri. Priyamvada Pande Vidarbha Vibhga Sanghathak. The workshop ended with shanti mantra. Along with 108 Aanandalayas in tea garden area we have started working in 4 communities as follow up of Janajati sammelan held at kanyakumari in September 2015. In Goalpada district Maladhara area of Rabhas saw formal inauguration of 4 Aanandalayas on 3rd April. HIMAJYOTI RABHA RENUKA RABHA PHULUMONI RABHA AND SHRUTIRANI RABHA are our 4 Acharyas who are working to start the work since 2 months. This month’s newsletter brings you the extracts from our popular book “Samagra Vikas” – Development with a Human Face. Prelude to different topics in the book is written by our colleague Shri.N.Krishnamoorthi. He has used Tenali Raman as a Mascot who describes the real education. In our happenings section, we have a series of training programmes for Fish Amino technology, which were sponsored by NRDC, New Delhi. Inauguration of Varma camp, having overwhelming response and students coming from Colleges for internship. In the wisdom section, we have C.Douglas Lummis, an American lecturer writing on Equality, Wolfang Sachs, a famous German researcher giving Co-relation between Languages and Culture ad Claude Alvares, an environmentalist from Goa tells us about the limitation of Modern Science. You can download and read our newsletter here. As informed earlier, we will be sending a separate newsletter on “Green Rameswaram” project describing the works of various partners and stakeholders. The role of VK-Nardep in Green Rameshwaram project is only of a catalyst. Sthanik KPS was organised by Vivekananda Kendra - Kadapa Nagar from 24-27 March 2015. 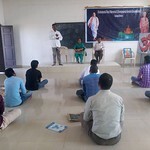 8 completed the Shibir succesfully in the Shibir held at Balaji College of Information Technology and Management, Kadapa. Dr Chandrasekhar Sharma, Mahavidyalayin Samparka Pramukh and Sri Maruthimohan Reddy, Vubhag Pramukh took some of the key bouddhik sessions. The concluding address was given by Er Amir Basha, Chairman, The Institute of Engineers, Kadapa and Smt Pratibha Bharati, Member, Nagar team, Kadapa and Executive Director, SC Corporation, YSR District and Shri AK Basha, Saha Vyavastha Pramukh, Kadapa Nagar. where 207 patients were examined and treated in Lazu and Khonsa areas. 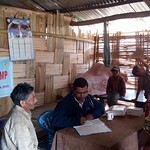 In the later parts of the month 7 camps were organized in Khimiyong and Bordumsa areas of Changlang district, where 601 patients were treated. Free medicines were distributed to all the needy patients. The Medical team of Vivekananda Kendra along with the mobile medical van conducted the camps as people are suffering from various diseases in these remote areas as the monsoon is arriving. Yoga Satra: 1.3.2016 to 7.3.2016 yoga satra held at Varadaraja swamy temple , Varkod village, T Narsipura taluk. Total 76 participants attended class. Pranayama and Meditation class: 7.3.2016 to 11.3.2016 pranayama and meditation class held at Smt. Nagaratnamma’s house, T K Layout, Mysore. 8 people attended. Maha Shivaratri celebration: On 6th March, celebrated maha shivaratri festival at Jayanagar, Mysore. Lingastaka chanting, om nam shivaya chanting, Bhajan conducted. Special Bhajan and Satsang : On 9th March, Sri C V Keshavamurthy and group conducted bhajan and Satsanga at Kendra. 80 people attended. Sri Ramakrishna Jayanti celebration: On 10th, March Bhagvan Sri Ramakrishna Jayanti celebrated at Kendra. All Anandalaya children, parents and welwishers participated. Sri C V Gopinatji was the special guest. Song on Sri Ramakrishna, stories on Sri Ramkrishna was told. Ma. Sarasaswati Pooja: On 5th, March Saraswati pooja held at Anandalaya, K G Koppal. Su. 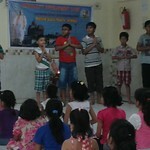 Shanta didi, teacher conducted pooja, Bhajan . All students offered flower to goddess. 38 students present. Abhyasa Varga: Every Monday Abhayasa Varga started at Kendra. 7 people are attending. 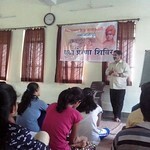 Swadhya Varga: New Swadhaya varga started on Satuday at Kendra. Computer Education: Computer Awareness programme started at Kendra on 6th March sponsored by Reserve Bank Of India and Galatic India, Mysore( softwere company). Cources : Tally, Ms Office.